50 FTE (full time equivalent) or 86-120 staff are to lose theirs jobs. Staff were given a preference form asking for reduction of hours or voluntary redundancy. Community Library deadline to be extended. UPDATE: A Library Staff Consultation has now been opened which will run until 19 Aug 2011. Redundancy packages for staff will be worse from the end of Oct 2011. It is believed that Community and Mobile Libraries decisions will be deferred until October 2011. A new library structure is planned for 1 April 2012. 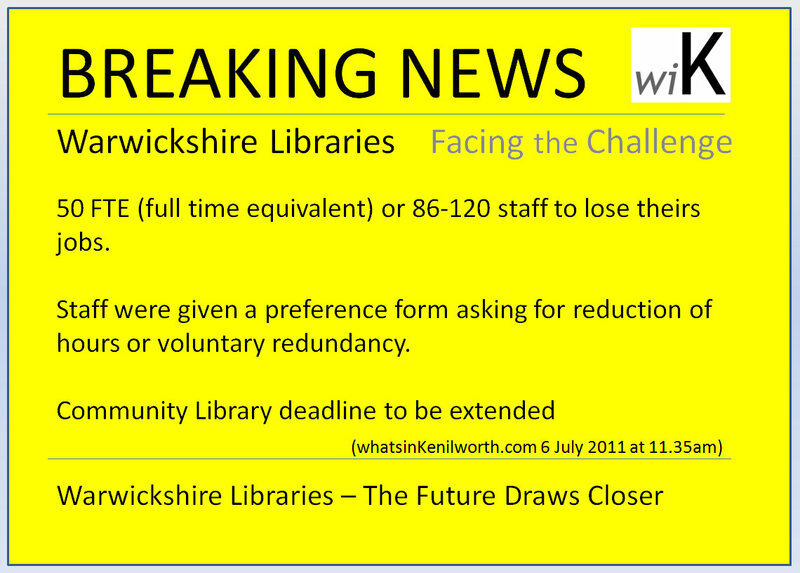 Library Staff feel angry over Warks Direct and WDC Staff taking their jobs. It is understood, comments were also made on lack of communication from managers and lack of action from unions. More to Come. If the libraries go where do the surplus books go? How refreshing to hear a Councillor sticking up for the library service. Shame the management don't feel the same. There are Councillors who support the Library Service in it's current form. Every meeting I have attended follows a pattern of Conservative proposals, Labour opposition, Lib Dem Opposition Conservative blame Labour (for previous Labour government...vote goes with Conservative majority. Please attend the next meeting, if you can, and see for yourself.